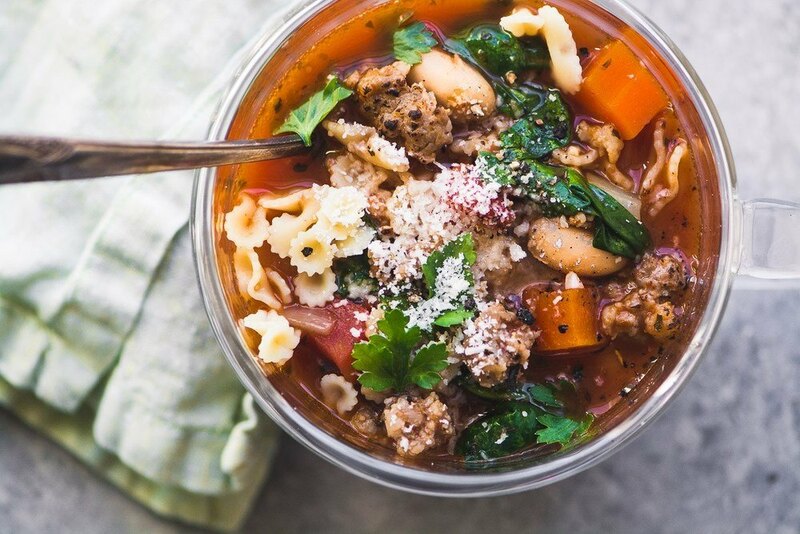 Italian Sausage and Bean Soup is hearty, comforting, and quick to make, in under an hour. It rivals Grandma's chicken soup for curing what ails you! Brown the sausage in a large soup pot. You can add a touch of olive oil first if you like, I don't find it's necessary. Break apart the sausage into small bits as it cooks, and let it cook until nice and browned. Remove the sausage to a paper towel lined plate, but leave the fat behind in the pan. Add the onion, carrot, celery and garlic to the pan and sauté for about 5-10 minutes, stirring often, just until they start to soften. Return the sausage to to the pot with the tomatoes, paste, and broth. Season with the Italian seasoning, bay leaves, and a good grinding of black pepper. Hold off on the salting to taste until the end. At this point I bring the soup up to a boil, then I turn the heat off and cover. I let it sit for about 30 minutes. I love this technique because the flavor get a chance to develop but the veggies don't get boiled to death. When you're ready to eat, add the beans, and greens, and bring back up to a simmer. Taste to add salt, or any extra pepper. The trick with the pasta is to add it individually to each serving, you can put a little at the bottom of each bowl as you ladle out the soup. This is important because if you mix pasta into soup it will eventually soak up all the broth. Serve this soup with a generous amount of grated Parmesan.